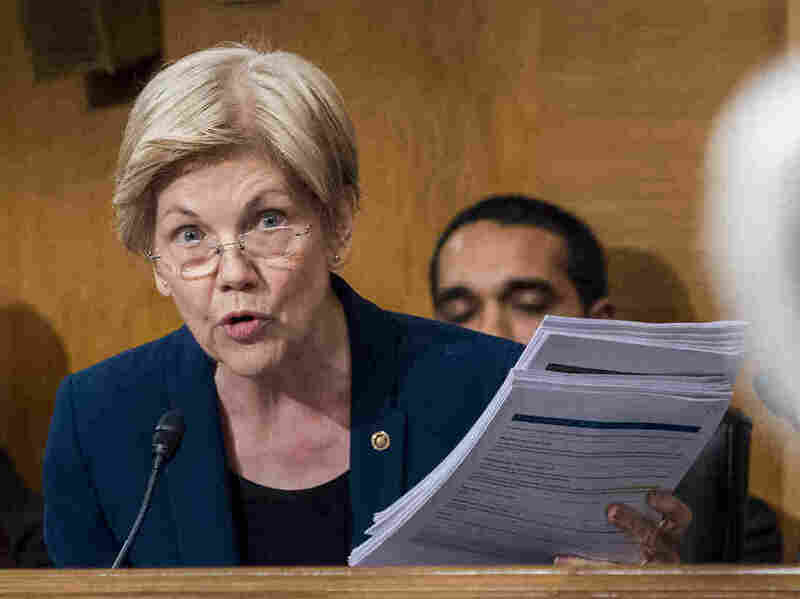 Republicans Vote To Silence Sen. Elizabeth Warren In Confirmation Debate : The Two-Way After Warren quoted Coretta Scott King and Sen. Edward Kennedy, Republicans invoked a Senate rule that silences a member accused of impugning the integrity of a colleague. Sen. Elizabeth Warren, D-Mass., in a Senate committee hearing last year. The words were those of Coretta Scott King, widow of the Rev. Martin Luther King Jr. But they resulted in a rarely invoked Senate rule being used to formally silence Sen. Elizabeth Warren, D-Mass. On the Senate floor Tuesday night, Warren read aloud from a letter Scott King wrote in 1986, when King objected to President Reagan's ultimately unsuccessful nomination of then-U.S. Attorney Jeff Sessions to a federal district court seat. Sessions, now a Republican senator from Alabama, is President Trump's nominee for U.S. attorney general. Warren was speaking in the debate leading up to Sessions' likely confirmation by the Senate on Wednesday evening. King wrote that Sessions used "the awesome power of his office to chill the free exercise of the vote by black citizens" — and that was the line Senate Majority Leader Mitch McConnell would later cite in his objection. "I call the senator to order under the provisions of Rule 19," McConnell said after interrupting Warren's speech, in which he said she had "impugned the motives and conduct of our colleague from Alabama." That objection came nearly 30 minutes after Warren was initially warned about impugning Sessions by Sen. Steve Daines, R-Mont., who was presiding over the Senate at the time. Rapping on the presiding officer's desk, Daines had initially cut Warren off some 20 minutes into her speech. "The senator is reminded that it is a violation of Rule 19 of the standing rules of the Senate to impute to another senator or senators any conduct or motive unworthy or becoming [sic] a senator," Daines said, apparently reading from a note on his desk. "Mr. president, I don't think I quite understand," Warren replied. "I'm reading a letter from Coretta Scott King to the Judiciary Committee from 1986 that was admitted into the record. I'm simply reading what she wrote about what the nomination of Jeff Sessions to be a federal court judge meant, and what it would mean in history for her." Daines said his interruption was a "reminder" that didn't necessarily apply to what Warren had just said. "However," he continued, "you stated that a sitting senator is a disgrace to the Department of Justice." Warren replied that the comment seemed to have been made not by King, but by the late Sen. Edward Kennedy — whom she also quoted — "although I would be glad to repeat it in my own words," she added. Without mentioning that the flagged statement had been made before Sessions was a member of the Senate, Daines — repeating the words of a female staff member who seemed to be reading aloud — sought to clarify the rule's scope. "The rule applies," he said, relaying the staffer's words, "to imputing conduct or motive through any form or voice." He added, "Form of voice includes quotes, articles, or other materials." Warren replied, "So, quoting Sen. Kennedy calling then-nominee Sessions a disgrace is a violation of Senate rules? It was certainly not in 1986." "In the opinion of the chair, it is," Daines said. As Warren began to speak, he added, "And the senator is warned." That formal warning set up the later interruption — and the forced termination of Warren's remarks. Warren sought another clarification, as to whether she is allowed to "accurately describe public views" and statements about Sessions. Again taking cues from the same staff member whose words he repeated, Daines replied, "The chair has not made a ruling as respect to the senator's comments. The senator is following process and tradition by reminding the senator of Massachusetts of the rule and the things of which it applies." "So, can I continue with Coretta Scott King's letter?" Warren asked. "The senator may continue," Daines replied — granting a permission that would turn out to be short-lived. Some 23 minutes later, as Warren spoke about Sessions' vote against reauthorizing the Violence Against Women Act, McConnell addressed the chair to object to Warren's remarks — specifically, her earlier quoting of Coretta Scott King's words. By that time, Warren had finished reading King's letter more than 10 minutes previously. "Quoting King technically put Warren in violation of Senate rules for 'impugning the motives' of Sessions, though senators have said far worse stuff. And Warren was reading from a letter that was written 10 years before Sessions was even elected to the Senate. "Still, top Senate Republican Mitch McConnell invoked the rules. After a few parliamentary moves, the GOP-controlled Senate voted to back him up. "Now, Warren is forbidden from speaking again on Sessions' nomination. A vote on Sessions is expected Wednesday evening."